Brussels-based chemical giant Solvay announces that the board of its affiliate, Solvay Indupa, has approved a further US$ 135 million investment program to expand and increase the competitiveness of its vinyls production plant of Santo Andre, Brazil. This second stage of expansion, following a plan announced in August 2006, comprises the creation of an integrated plant to produce ethylene with ethanol originating from sugar cane. Ethylene is one of the two main feedstocks needed to manufacture polyvinyl chloride (PVC) - together with chlorine, which is produced through a salt-based electrolysis process. Santo Andre would be the first industrial project in the Americas implementing renewable, green resources for the production of PVC. This innovation will prevent the emission of large quantities of C02 into the atmosphere. In the case of sugarcane based 'bio-ethylene', the reduction can even be larger than 100% (check out why, here). Just recently, scientists reported that the utilisation of bio-based feedstocks for the production of 16 of the most commonly used bulk chemicals can reduce emissions by up to a billion tonnes of CO2 in future scenarios (earlier post). 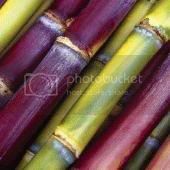 Sugarcane was identified as the leading candidate for efficient bio-based chemicals and is attracting considerable attention from manufacturers and researchers (here, here, here and here). Bulk chemicals, currently made from petroleum and natural gas, are used in the production of everything from plastics and fertilizers to electronic components and medicines. Ethylene (C2H4) is the most produced organic compound in the world with global production exceeding 75 million metric tonnes per year. Polyvinyl chloride (PVC) is a thermoplastic polymer and one of the most valuable products of the chemical industry. PVC can be found in thousands of commonly used products, ranging from pipelines and hoses to traffic signs and floors. Solvay Indupa’s ambition is to complete the expansion of Santo Andre by 2010. The plant would then have an installed capacity of 360,000 tons/year of PVC; 360,000 tons /year of vinyl chloride monomer (VCM), 235,000 tons/year of Caustic Soda and 60,000 tons/year of bio-ethylene. In order to finance these investments, Solvay Indupa is considering a capital increase of approximately USD 130 million, to be placed in local and international capital markets through Brazilian Depositary Receipts (BDRs) at the São Paulo Stock Exchange (Bovespa). The Solvay group is one of the world’s leading vinyls producer, ranking second in Europe and third globally. In addition to SolVin, its joint venture with BASF in Europe, the Group’s activities in PVC and other products of the vinyl chain span across Asia and Latin America, through the affiliates Vinythai in Thailand and Solvay Indupa in Argentina and Brazil. Solvay Indupa, a company of the Solvay group, is one of the most important petrochemical companies in the Mercosur. Its main products are PVC resins and Caustic Soda. Solvay Indupa has its main offices in Buenos Aires, Argentina and two industrial sites: in Bahía Blanca (Argentina) and Santo André (Brazil). Solvay holds 70.1% of Solvay Indupa, which is listed on the Buenos Aires stock market. Solvay is an international chemical and pharmaceutical group employing some 29,000 people in 50 countries. In 2006, its consolidated sales amounted to €9.4 billion, generated by its three sectors of activity: chemicals, plastics and pharmaceuticals. In June, a competitor to Solvay, Braskem (the leading company in Latin America's thermoplastic resins segment and Brazil's second largest privately owned industrial company), announced it had produced the first batch of internationally certified polyethylene made from sugarcane ethanol (more here). The Dow Chemical Company and Crystalsev, one of Brazil's largest ethanol players also unnveiled plans for a world-scale facility to manufacture polyethylene from sugar cane (earlier post). Solvay: Solvay Indupa will produce bioethanol-based vinyl in Brasil & considers state-of-the-art power generation in Argentina - December 14, 2007. Malawi's much discussed super harvests, which turned the country from a food aid dependent begging bowl into a major food exporter, were the result of a simple, coordinated government intervention: the subsidization of fertilizers for small farmers. This example is important to the bioenergy community because it proves food insecure countries with a large agricultural potential can turn their fate around with modest means and simply by improving access to the most basic modern farm inputs. If all developing countries with a large biofuel potential were to introduce similar measures - and the FAO recently called for such interventions - then the huge global bioenergy potential could begin to be tapped in a safe manner without provoking a food versus fuel debate. Countries and regions that have already undergone the Green Revolution can still boost farm outputs simply by targetting fertilizer inputs better. Interesting recent results from precision farming trials in Punjab, India, showed rice yields can be increased consistently and fertilizer use reduced (previous post). Now the Government of Bangladesh announces that it will expand a similar technology, known as 'urea deep placement' (UDP) - a successful technique that doubles the efficiency of urea fertilizer use - to almost 1 million hectares of rice land, reaching about 1.6 million farm families, in the coming 'boro' or dry season. Bangladesh's successful trials with the technique are now being replicated elsewhere in South Asia and in Africa. UDP is the insertion of large urea briquettes into the rice root zone after transplanting. UDP cuts nitrogen losses significantly. Farmers who use UDP can increase yields by 25% while using less than 50% as much urea as before. The effectiveness of UDP technology in Bangladesh was proven through research funded by the International Fund for Agricultural Development (IFAD, also active in promoting bioenergy in the South) and implemented with the assistance of IFDC - an International Center for Soil Fertility and Agricultural Development. The Ministry of Agriculture of Bangladesh has requested that IFDC help implement the expanded project. Millions of rice farmers in Asia depend on urea fertilizer to meet the nitrogen needs of high-yielding rice varieties, says Dr. Amit Roy, IFDC CEO. Most farmers, including those in Bangladesh, Vietnam, and Cambodia, broadcast urea into the floodwater. But broadcasting is a highly inefficient application method because most of the nitrogen is lost to the air and water. Only one bag of urea in three is used by the plants. Using UDP, Bangladesh's dry season rice production is expected to increase by 548,000 tons, according to the Department of Agricultural Extension (DAE). The technology not only improves farmer income, but creates employment because of the need for the briquettes. Ten Bangladeshi manufacturers have produced and sold more than 2,000 briquette-making machines. The new UDP program will include the manufacture and establishment of some 300 briquetting machines to manufacture 2.7-gram briquettes. UDP technology was introduced in Bangladesh in the late 1990s; by 2006 more than half a million farmers had adopted UDP. Average paddy yields had increased 20% to 25%, and income from paddy sales increased by 10%, while urea expenditures decreased 32%. Farmers who use UDP can reduce urea use by 78 to 150 kg/ha and increase paddy yields by 900 to 1,100 kg/ha. The net return to farmers of using UDP versus broadcasting urea averages $188/ha. Bangladesh's success with UDP has become a model for other rice-growing countries, Roy says. IFDC has also introduced UDP in Cambodia, Vietnam, Nepal, Nigeria, Mali, Togo, and Malawi. Improved rice production implies a greater availability of the already abundant rice by-products such as hulls and straw. These biomass streams can be utilized as feedstock in biomass power plants, some of which are being improved to burn this dedicated resource in a highly efficient manner (see the Fraunhofer Institute's work on dedicated fluidized bed combustion systems). The straw would also be an abundant feedstock for next generation cellulosic ethanol and synthetic biofuels. Progress Energy Florida (PEF) announces it has signed another contract with Biomass Gas & Electric LLC (BG&E) to purchase the electricity from a second waste-wood biomass plant planned for Florida. BG&E, based in Atlanta, Ga., plans to build a power plant in north or Central Florida that will use waste wood products - such as yard trimmings, tree bark and wood knots from paper mills - to generate electricity. It would produce around 75 megawatts, or enough electricity to power 46,000 homes. The plant is expected to avoid the need to burn nearly 5 million tons of coal over the 20-year life of the contract. It would be identical to BG&E's waste-wood plant announced in July. Progress Energy Florida agreed to buy the output of that plant as well (previous post). The green energy plant will use a gasification process to turn biomass into an easily combustible, hydrogen rich syngas. To do so, BG&E's waste-wood plant relies on the SilvaGas process developed by Future Energy Resources Corporation. Historically, biomass gasification technologies have been based on coal gasification designs. Those conventional combustion technologies do not take advantage of the high chemical reactivity of biomass, wasting energy and leaving behind residue typically generated through a burning process. The SilvaGas process focuses on advanced gasification technologies specifically designed to gasify biomass and utilize the high chemical reactivity of the biomass feedstock. These processes typically feature a compact plant footprint and are not an incineration or combustion processes. Including the elimination of net CO2 additions to the environment, these advanced processes reduce the environmental impact of power generation by 90% compared to typical fossil fuel based power plants. The contract will be filed for consideration with the Florida Public Service Commission (PSC). The company seeks PSC approval of the contract and certification of the proposed plant as a qualifying facility under Florida laws and regulations that encourage renewable energy. In the past two years, Progress Energy has signed contracts to add nearly 300 megawatts of renewable energy to its system - which is enough to power 170,000 homes. In July, the company issued a request for renewables in an effort to continue to expand its alternative-energy portfolio. In May 2006, Progress Energy signed a contract to purchase the energy output (130 MW) from the nation's largest biomass plant to be built in Central Florida. The project, which will utilize an environmentally friendly, dedicated energy crop known as 'E-grass' (Miscanthus x giganteus) as its fuel source, will reduce carbon emissions by more than 20 million tons over the 25-year life of the contract when compared to coal (earlier post) . Progress Energy Florida: Progress Energy Florida signs contract for second waste-wood plant - December 18, 2007. In the search for renewable and alternative aviation fuels, the US Air Force (USAF) completed the first ever transcontinental flight of an aircraft using a blend of regular aviation and synthetic fuel. These synfuels can be produced from virtually any type of carbonaceous feedstock, including any type of renewable biomass. A C-17 Globemaster III using the synthetic fuel blend lifted off shortly before dawn at McChord Air Force Base, Wash., and arrived in the early afternoon at McGuire AFB, N.J., where it was greeted by Secretary of the Air Force Michael W. Wynne, New Jersey Rep. Jim Saxton, and a number of officials from both the airline and energy industries. The flight follows successful tests of the fuel blend in C-17 engines in October, and is the next step in the Air Force's effort to have its entire C-17 fleet certified to use the mixture. Air Force officials certified B-52 Stratotankers to use the mixture in August, and hope to certify the fuel blend for use in all its aircraft within the next five years. Synthetic (bio)fuels are obtained from the gasification of carbonaceous feedstocks, after which the syngas is then liquefied via Fischer-Tropsch (FT) synthesis. The process can use both biomass (biomass-to-liquids; BtL), gas (GtL) or coal (CtL). The resulting fuels are ultra-clean, and when biomass is the feedstock both CO2, NOx and SOx emissions are reduced greatly. The synthetic fuels have the potential to reduce the United States' dependency on foreign energy sources. The fuel blend used by the Air Force mixes JP-8 with the Fischer-Tropsch fuel. The FT process is a method that can convert virtually any carbon-based material into synthetic fuel and was invented by German chemists Franz Fischer and Hans Tropsch developed the method in the 1920s. Earlier this year, the U.S. Department of Energy’s National Energy Technology Laboratory (DOE/NETL) and the U.S. Air Force released a study that examines the feasibility of producing 100,000 barrels per day of synthetic jet fuel from coal combined with biomass. The study made a life-cycle analysis and showed the coal+biomass-to-liquids (CBTL) facilities could cut emissions of carbon dioxide (CO2), the primary greenhouse gas, by 20 percent compared to conventional petroleum processes. The resulting fuels would be competitive at current oil prices. Picture: A C-17 Globemaster III flies over New York City after completing the first transcontinental flight on synthetic fuel Dec. 17. The C-17 took off before dawn from McChord Air Force Base, Wash., and landed in the early afternoon at McGuire AFB, N.J. Credit: USAF. Air Force Link: C-17 uses synthetic fuel blend on transcontinental flight - December 18, 2007. Members of the Southern Agricultural Council (Consejo Agropecuario del Sur, CAS) have agreed to carry out research and develop policies to increase sustainable biofuel production across South America. The decision was made during the 13th CAS Regular Meeting, in Asunción, Paraguay. We stress the importance of bioenergy for the CAS member states and take account of the social, techno-political and environmental implications of the sector. From now on we consider bioenergy to be a priority for the CAS, as it can contribute to local and territorial development. Importantly, the countries agreed to develop a policy framework that will ensure bioenergy becomes a productive sector that yields social benefits and employment, without damaging the environment and without displacing food production. It will also work to protect and recognize land rights to farmers, and will promote the participation of family run farms in the sector. The framework will identify the zones suitable for agriculture, forestry and pasture development in the member states and analyse which regions should preferrably be devoted to bioenergy production and food production respectively. CAS will foster scientific, technical, financial and policy cooperation amongst its member states because the sector spans several common themes found in all countries. They further agreed to develop a dialogue on issues such as scientific and technological exchange, comparative review of legislation, biofuel production and frameworks to monitor environmental impacts. This dialogue will be shared throughout the hemisphere and with other regions in the world. To do this, the declaration mentions the establishment of an ad-hoc Coordination Group for Biofuels which will strive towards managing this cooperation throughout MERCOSUR. The technical bureaus of the REDPA (Red de Coordinación de Políticas Agropecuarias) receive a mandate to track the technological, market regulation, management and legal developments on biofuels internationally and report to CAS member states. CAS member states will develop a common strategy to attract (foreign) investments in the biofuels sector throughout the region and will cooperate on designing the most optimal investment climate to that end. All of the countries involved — except Chile — already have national legislation on biofuels. Every country will consider their national strategies, to set their own goals and deadlines to move agro-energy development forward. For example, Chile intends to consolidate its use and production of biofuel —mainly bioethanol — by 2012. In Argentina the Biofuels Promotion Law, passed last year, says that from 2010 fuels such as gasoil and diesel will have to be blended with five per cent biofuel. Earlier this month sugar cane-derived ethanol was included in a list of biofuels that can be added to conventional fuel in Argentina (previous post). Consejo Agropecuario del Sur: Declaración de Ministros y representantes de Agricultura [*.pdf] - December 3 - 4, 2007. Consejo Agropecuario del Sur: CAS expresa posición regional sobre agroenergía y agricultura familiar - December 4, 2007. According to Germany's VERBIO (Vereinigte BioEnergie AG), one of the largest biofuel producers in Europe, the German government's recent decision to phase out tax relief on biodiesel and bioethanol will damage the industry. It fears German producers will not be able to withstand competition from biofuels made in the South, notably Brazil. Earlier, the German Social Democratic Party proposed a total biodiesel quotum of 7 % and a general exemption of public transportation and agriculture from the petroleum tax. To VERBIO, this would have been a sustainable concept for a continuance of the German biodiesel industry which the entire sector could have accepted. But the government did not take up the proposal, and pursues its course, which means a further reduction of the tax relief for biofuel and leaving the regulations on admixing, introduced at the end of 2006, unchanged. VERBIO thinks the German government thus blocks the chance for the new biofuel industry in Germany to establish its market. It is to be expected that at the beginning of 2008 more than 50 % of the biodiesel plants will have to be shut down for good since no market will exist. Added to this is pressure from biodiesel 'dumping' from the US, via an export subsidy, which has hit German biodiesel producers badly (more here). The bioethanol market in Germany will continue to suffer due to insufficient demand and cheap imports from Brazil, VERBIO says. VERBIO is not certain whether this plan will have positive effects on domestic biofuel production and its suppliers. VERBIO calls on the government instead to focus more on measures to halt to the undesirable developments arising from the use of biofuels, for instance, the deforestation of the rain forests in South America and the tropical forests in Asia. Despite what it calls an 'unsatisfactory decision' of the German government, the management board for VERBIO continues to assume that the long-term growth trend in the biofuel market will remain intact in Europe. The management board says it will continue to implement measures to strengthen competitiveness in order to profit from an improvement of the biofuel industry's economic situation in 2008. DJ DGAP: VERBIO: Biofuels contribute to climate protection and provide new jobs - Outlook for 2008 confirmed - December 18, 2007. A few years ago, a group of socially engaged students decided to explore the potential of biofuels to contribute to sustainable development in the countries of the South, and to investigate whether they could lead to new agricultural opportunities for farmers there. Biopact had a vision: in a world of ever increasing oil prices and the need to address climate change, developing countries with lots of land resources and in search of new agricultural markets would enjoy their comparative advantages and produce fuels from energy crops for their own and for international markets. Given their abundant natural resources and the lack of these in energy hungry economies, a relationship connecting efficient producers in the South to wealthy consumers in the North would have been an interesting option. Such a 'win-win' could have brought rural development in places where it is much needed, and perhaps a form of global social and environmental justice. When we launched this small idea of a rational 'pact' we were aware of the fact that it calls for thorough reform of many current practises, so that poorer farmers in the developing world can compete: (1) a reduction of farm and biofuel subsidies in the wealthy countries (EU, US); (2) trade reform and the abandonment of biofuel import tariffs in these same countries (Doha, but as the G20 sees it; recognizing biofuels as 'environmental goods' under the WTO regime); a commitment by industrialised nations to assist developing countries in tapping their abundant resources in an environmentally and socially acceptable way. The concept furthermore called for courageous investments from Europe and other industrialised nations in the South, which could have taken the form of targeted development assistance: investments in science and agricultural research capacities; biofuel technology transfers; investments in transport infrastructures, in improved marketing and in market access; supporting efforts to promote good governance and putting pressure on local governments to make work of land reform and rural development; a strengthening of the cooperative movement and of other communal modes of production. Even though many organisations have signalled that they basically agree with the organisation of such a pact and with the reforms that are needed to make it work, very few concrete steps towards it have actually been taken. Meanwhile, biofuels have boomed in places where their production makes least sense and where they contribute least to development: namely in the countries that can easily cope with food price increases and fuel price highs, that is, the wealthy West. American and European farmers have become rich, but risk ruining both the food and energy security of hundreds of millions of the world's poor. The rush into outright destructive palm oil production for biodiesel has been completely irresponsible as well - rainforests are being razed resulting in unacceptably high amounts of carbon emissions and the destruction of countless species that will never appear on this planet again once they're gone. But the continuous food price increases resulting from the wholesale conversion of millions of tonnes of the most basic foodstuffs on which we all depend - wheat, maize, vegetable oils, sugar - into fuels for the wealthy urban classes of this world, are the single most important factor that makes the current mode of production of biofuels totally unethical. The trend of multinationals 'capturing' cheap land, cheap labor, and cheap governments in developing countries is nothing less of a new form of commodity driven colonialism. In short, the gap between, on the one hand, our ideal of a rational North-South pact based on biofuels that contribute to sustainable development and result in social benefits for those who need it most, and, on the other hand, the actual situation, which represents the complete opposite, has become too great. Therefor Biopact can no longer support nor report in a neutral way on biofuel ventures that still produce fuel from food. Not for as long as newer generations of biofuel technologies don't become available on a larger scale and completely push food based production out of the market; and not for as long as the most basic steps needed for a 'biopact' haven't been realised (unambiguous trade reform, farm policy reform in the wealthy countries, and so on), so that rural populations in less developed countries for once get a chance to guard themselves against the vagaries of global commodity markets and instead can benefit from these markets. For the time being, we will only support the small scale, local use of biofuels for communities that decide for themselves - in full sovereignty and independence - that it makes sense to do so, for them and for whichever reason (improved farm incomes, greater mobility or energy security at the household, local or regional level). We think of a community of farmers in Ghana (picture) who decided to produce biodiesel from their palm oil for themselves, because local diesel fuel is more expensive but extensively used in the most basic of operations: irrigating fields, pumping drinking water, powering electricity generators, transporting farm goods to market. We think of Practical Action's project in Peru, which helps poor riverine communities out of their isolation with biodiesel they make themselves and which they use in their boats, to transport people and goods to nearby markets. We think of the many initiatives involving household biofuels, such as gelfuels for cooking or biogas for heating, cooking and lighting. Think of ICRISAT's 'pro-poor' biofuels initiative based on opening new markets for farmers in drylands. Such initiatives - and there are many of those but they don't make the headlines easily - can have genuine social, economic and environmental benefits for vulnerable communities. What we think worth supporting too, are national efforts developed by governments in dialogue with civil society, to develop biofuel programs that are explicitly aimed at achieving social justice and rural development. We think of Brazil's 'Social Fuel' scheme, which offers poor farmers an opportunity to produce oil crops on land where not much else grows, and under strictly regulated conditions, as part of cooperatives, taking into account the recognition of land titles, with guaranteed prices for the feedstock and guided by expert assistance allowing them to acquire farming skills they can apply in other contexts - a long list of preconditions makes this a genuinely social program. We think of Nepal's national biogas project, which succeeds in reducing the unsustainable consumption of primitive biomass, and which offers an inexpensive, clean and practical alternative form of household energy that directly benefits thousands of people and the immediate environment in which they live. However, the large-scale production of food based biofuels grown in unsustainable monocultures for 'export' and for 'the global market' - that anonymous, abstract, at times dangerously perverse system - does not make sense. Biofuels may well have a 'theoretical' and 'technical' potential that puts them on a par with fossil oil over the long term - and much to the dismay of some, we have continuously referred to this 'potential' - but the sheer number of conditions that must be met to actually utilize these resources in a socially acceptable and genuinely environmentally sane way, is simply too large and can't be implemented rapidly enough. For all these reasons, Biopact joins those who call for a real moratorium on (1) biofuels made from food crops, (2) biofuels that are obtained from destructive (plantation) practises such as palm oil in South East Asia or soybean in Brazil, (3) biofuels of which it cannot be demonstrated that they do not contribute in an indirect way to such destructive pressures on the environment and on biodiversity (these would include some sugarcane plantations in Brazil), (4) biofuels based on practises that result in the displacement of people from their lands or in the weakening of their livelihoods and local environment, (5) or that contribute to any kind of social or economic developments leading in any indirect way to such negative social and environmental consequences on communties that already have it difficult enough to defend their interests. Social and environmental biofuels criteria developed by Europe are a minimum minimorum, but even this will not suffice to avoid these risks or to curb the current trends. Such criteria will be used as tools for an easy greenwash by companies who know very well that (non)adherence to the rules will never be monitored let alone sanctioned thoroughly enough. If we take palm oil made by companies adhering to the criteria developed by the 'Sustainable Roundtable on Palm Oil' as an example for such rules, we can only fear the worst. In conclusion, from now on Biopact will only report on small scale bioenergy and biofuel initiatives, will scrutinize and criticize the many developments that drive food and energy insecurity in developing countries (and even in highly developed countries, because even there many less well-off people are finding it difficult to cope with rising food prices), will no longer legitimise 'temporary negative effects' of biofuels by thinking that somehow, miraculously, they will disappear in a larger, future context. Biopact will continue to track technological and scientific developments in the sector, debates about subsidies and trade reform, investments in physical, economic and social infrastructures related to biofuels in developing countries and other conditions that need to be met in order for us to begin to take the chances for such a future pact seriously. We don't think we have been wrong in promoting the idea we stand for. Naive, yes, perhaps. But at least we think we can say we have presented a voice in-between two common and dangerous positions: one that represents a business-as-usual case, held by those who consider biofuels to be just another commodity ready to make the powerful even more powerful; and another one that focuses blindly on negatives only while ignoring that bioenergy and biofuels could offer genuine chances for 'sustainble development'. We think our exercise has been 'fertile' and has 'fermented' quite a fruitful debate. We have presented our view to some key decision makers - amongst them the EU - and have published it, so nobody can say that the proposition was never expressed. But now it is time to scale down, in order to power up a more realistic future.